Activities for parents and children to do together. Very young children learn skills like sitting still, concentrating, taking turns. Parents practice interacting with children and teaching them. Goals: encourage parent-child interaction; empower parents to teach their own children; increase pre-reading/pre-writing skills; develop local languages. Language: The leader may use the national language. The parents and children should feel free to do the activities together in the language they use at home (“mother tongue”). Note to leaders: Several activities are listed with each topic. Choose one or two. If you are not a member of the parents’ culture, always make sure ahead of time that activities and (especially) gestures are culturally appropriate. The topics can be used in any order, though these are suggested. Small, Big, or Same Size? 1. Hello, My Name Is . . . This first meeting should focus on making a warm, familiar environment for everyone attending, especially the children. Children may stay on their parent’s lap and play and answer from there. Of course, they are also free to stand and move around during the motion activities. Goal: familiarize the children and parents with the place and with each other. Materials needed: different-colored napkins or pieces of cloth for each child-parent team; a ball (of crumpled paper), a soft toy (alligator, tiger, lion or dog) or drawing of a person, balloons (or colorful snips of paper) for each child. The leader will go to each parent-child team and help them to tell their name to the whole group and ask him/her how does the child wants to be greeted in that day. Does the child want the group to wave their right hands, for instance, or their left elbows? Nod their heads? Or some other body part? Then sing it out loud on the rhythm – the name of the child and greeting him/her the way they requested: “My name is …., my name is …, Hello….., say hello to me!” (while they are singing hello…, they have to make the required greetings – with the hands or head or other parts of the body). 2. The leader shows his soft toy and covers different parts of the body of that toy; the parents have to do exactly the same thing with their children. They repeat together with the leader: where is the foot? where is the hand? Where is the nose? where is the belly? – at the same time everyone uncovers his/her body part that had been covered up and answers: here it is the nose, here is the elbow . . . . Variation: Use a small cloth or napkin to cover the body parts of soft toys, dolls, or drawings of children. Note to leader: Check ahead of time what is culturally appropriate when it comes to covering, waving, or even mentioning parts of the body. 3. The leader brings the ball and pass it randomly from team to team (parent and child – form a team); this time the children have to say their age. If they drop the ball, the parent-child team has to jump up and down three times, say the age of the child, and then pass the ball on. If they caught the ball, they just mention their age and pass the ball on. The game continues till everyone has had a turn. Read a short story. If it is in a story book with pictures, be sure to show the pictures as you read. Ask the children which characters in the story they liked it and why? Ask other questions to review or repeat the important events of the story. 4. The leader gives snips of paper to each parent-child team. The children have to blow on them to keep them in the air. These can be clipped from newspaper or magazines. Dried leaves or feathers might also be used. The parents and children put this in their hands, blow on them, collect the items, blow again. The idea is to have fun. 5. Balloons might also be used. Each child gets a balloon. Some music is put on. The parents encourage the children to play with the balloons. If the balloons cannot be easy to differentiate, before you ask them to play, the leader can provide permanent markers to personalize the balloons. Let the children feel free to interact with others or stay next to his parent. Put the music on and let them play for couple of minutes. Closing: Everyone lines up. They say their own name as they walk, one-by-one, out of the classroom. OR Everyone lines up. They greet the leader the way they wanted to be greeted (waving hand, elbow, whole arm . . .) as they leave the classroom. 1. Everyone gets a very small piece of candy (or something else good to eat). 2. Small steps/big steps. Have four children walk to the other side of the classroom. Two take very small steps. Two walk with the biggest steps possible. Which two took the most steps? Which two took the fewest steps? 3. Big/Small measured in height. One person stands in front of the board. They have spread their legs out as wide as possible. Mark how tall they are on the board. Then have this person stand normally, with their legs close together. Is this person now bigger? You can also have someone with a measuring tape measure precisely how big (tall) this person is when they stand with wide legs and when they stand normally. Ask who knows how they can make themselves very small? And how they can make themselves very tall (stand on something; walk on stilts; have someone lift you up . . . )? -put the finger you haven’t used yet on a big circle and your thumb on a circle that is much smaller. Tell the children that if their hands are not big enough to do this, they can use both hands: little finger of one hand on a small circle; thumb of the other hand on a big circle. They may also do this together with their parent. Option: Have parents take turns giving directions in whatever language they use at home. Option: If fingers have different names (ring finger, index finger, middle finger . . .) use these names. 6. Draw big and small. Everyone gets a piece of paper and a pencil. The leader chooses something that everyone can actually see to draw which are big and small. For example, a big tree; a big cow; a small calf. A big fence; a small bird. A big truck; a small car. A big cloud in the sky; a small cloud in the sky. A small airplane high in the sky; a big sun. A big apartment building; a small house/kiosk/bus stop. Everyone draws for themselves. They decorate the top and bottom edges with a border design (preparation for writing). If crayons or colored pencils are available, give everyone time to color in their drawings. Put all the drawings next to each other. Point out that everyone has done it differently, in their own way. Altogether it’s beautiful. Everyone is different and what they add/contribute makes the whole nicer/better/more beautiful. 7. Question: suppose you need to fix something or clean something at home, but you aren’t tall enough. How do you manage to reach it, anyway? Discuss the different ways you talk to people in different age groups. Have the group discuss what they consider the ideal age. If it’s appropriate, do this in the mother tongue. How you talk to people of different ages and how people of different ages live is culture-specific. 9. Three sizes. Set out three big things of clearly different sizes: big, middle, small. For example, three tables or three floor mats. When you say, “Big,” everyone goes to stand by the big one; when you say, “Small,” by the smallest one, and so forth. Later, divide the group in two (boys and girls; children and grown-ups; red shirts and blue shirts . . . ); each group has a different leader. The two leaders give directions. Take care to listen to your own leader—and not to run into each other. 10. Closing. Put a big thing and a small thing by the door (mat, chair, stuffed toy). Everyone may stand in a line behind the one they like the best. Count the people in each line. Tell which line is longer. The “small” line may go outside first, then the “big” line. 2. Clean cloth is soft; dirty is hard. Show an example using a shirt or a cloth. The clean one is soft. The one with dried spills or mud on it is hard. what about dirty clothes? How do you feel/think about them? when you use a cloth to clean, the floor/furniture/car/dishes gets clean, but the cloth gets dirty. Talk about this. How come the cloth gets dirty? What makes it dirty? Explain about bacteria (“germs”). Ask how the cloth or how clothes can become clean again. 3. Act out someone who washes clothes, from the beginning through to drying the clothes. Use only gestures, no words. Be sure to wash the way it is done by the people in the club. Perhaps arrange ahead of time to have a parent do this part. Be sure to exaggerate. For example, if soap bubbles or lather are part of the washing process, exaggerate how soft this would be. The group guesses what is going on and what the soft stuff is. May also act out washing dishes or some other cleaning task. 4. Hitting is hard; stroking or petting is soft. Demonstrate on a hard surface like a table. Discuss this in the group. Do you have a pet or work animal (horse, for example)? What is the best way to touch the animal—soft or hard? Why? Does your mother or father ever touch you softly on the head/cheek/shoulder? When do you like that? When do you want someone to do that? 5. When children fight, they do not touch each other softly. They hit each other very hard. Discuss this. Have you ever seen children fighting? Is it good to hit other people? What other options are there? 6. Make something soft, such as a pompom from yarn or a bit of cloth on a stick or a fake feather. It is nice to touch. 7. Make a box (hard). You can collect soft things from nature in the box like dandelion heads that have gone to seed. 8. 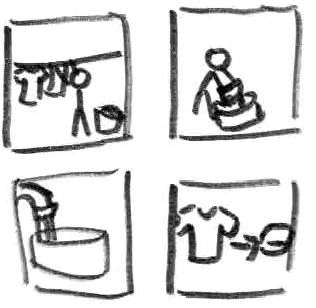 Make little drawings about doing the wash. Make these line drawings ahead of time and let the group color them OR have the group draw the steps to doing the wash. Each step should be a separate drawing. (Depending on local circumstances, this might be: get bucket, put water in, add soap; scrub clothes, rinse clothes, wring out clothes, hang up clothes to dry; fold clothes, put clothes away.) Mix up the drawings. Have the group put them in the proper order. 9. Make a “feeling sack” with soft and hard things in it. Anyone who wants to feel the things in it (and guess what they are) must first wash their hands. Wash your hands as an example. Closing: Everyone pets or strokes softly over their own hand before going outside. 1. Ask who knows how you can make a loud sound? And how to make a soft sound? Take turns making loud and soft sounds. 2. Play “telephone.” Sit or stand in a circle. Whisper a word in one person’s ear. They whisper it in the next person’s, on around the circle. Is the last person’s word the same as the first person’s? 3. Sing a couple of songs. After that, the leader claps out one of the songs without words. Clap so that syllables that are accented get a loud clap; other syllables get a soft clap. Who can tell which song it is? 4. Someone sits in the middle with their eyes closed. The leader points to someone else. This person goes as quietly as possible to stand behind the person in the middle. Continue doing this with several people. After a time, the person in the middle guesses how many have gone to stand behind them. Did they hear correctly? 5. Everyone spreads out in the classroom and closes their eyes. The leader sings a song while walking through the group. 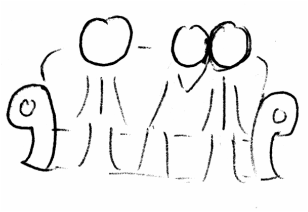 When the leader stops singing, everyone (with eyes still closed) points to where he/she is. Then everyone opens their eyes to see if they heard and pointed correctly. Take turns being the singer. 6. Group discussion: A sudden loud noise can be startling. It can make you jump. Who has had that happen? Have them describe the situation. 7. Give everyone (or every parent-child pair) 12 little pieces of paper. Everyone draws 6 things that make a soft sound and 6 things that make lots of noise. This will differ depending on the situation. Exchange papers with your neighbor. The neighbor sorts out soft and loud noises. Does the neighbor put things in the same piles as you would? 8. Someon e covered with a cloth or blanket makes a loud or soft sound. The rest of the group guesses what it is supposed to be. 9. Choose a dance that fits the group. Many dances include clapping, stomping, or making some extra noise. Learn the dance with the group. Closing: Choose a soft sound. Everyone makes this sound as they leave. 1. Put something smooth and something rough in a box or bag. Let people feel these things without looking at them. Ask what the difference is in what they feel—one is _____ and the other is ______. 2. Group discussion: name something that is smooth and something that is rough. (Note: this will differ per culture and language.) Maybe take turns calling out something that feels smooth and something that feels rough. 3. Talk about a little baby that the whole group knows. Discuss how soft the baby’s cheeks are. Then name someone who doesn’t shave very often. Their chin and cheeks feel rough. 4. Gather 10 pieces of cloth that are about the same size but have different textures: from very soft to very rough. Have the group put them in order, from softest to roughest. If the group is very large, divide into several groups, each with their own set of pieces of cloth. 5. 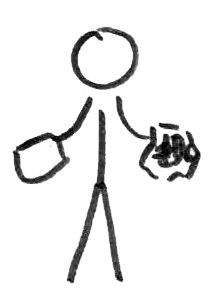 Everyone draws an activity that makes hands or faces rough. This will differ depending on the people’s circumstances (doing laundry; working in the fields; selling things in the outdoor market; hand work . . .). 7. Make sand paper with sand and glue. Use stiff paper; spread glue over it; spread sand over the glue; let dry. Have everyone sand a little piece of wood. The sand paper is rough, and the wood becomes smooth. 8. Use the sanded pieces of wood to make a little table, birdhouse, or some other thing that fits the local culture and situation. 9. Walking barefoot makes the soles of your feet tough. If it is culturally appropriate, have everyone look at the soles of their feet. Discuss: how many toes do you have? On one foot five and on the other foot five. Which toes are similar? Do these toes have specific names (example in English: big toe, little toe, middle toe). How do you take care of your feet? Talk about trimming toe nails and washing the feet. Discuss what happens when you walk through something dirty. Closing: Have the group sort themselves out in the following order: littlest feet first; biggest feet last. Leave, single file, in this order. 1. 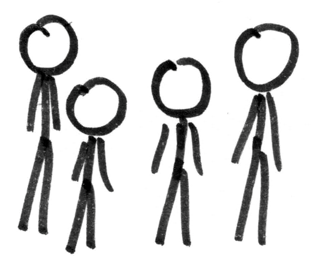 Paper People—Thick (Fat) and Thin. Ahead of time, cut out two paper people—one thin and one quite a bit wider. Also needed: Bright light. Paper and scissors for every parent-child. Possibly two books or blocks of wood, one thick and one thin. Shine a bright light on the board or a sheet of paper. Hold the thin paper person in front of the light, then the thicker, wider person. Talk about the differences between “thin” and “thick.” If fat children or skinny children are teased, discuss the difference between friendly teasing and bullying. Bullying is not a good thing to do. It makes the one bullied feel bad. May repeat with the books or blocks of wood. Have the children call out which one is “thick” and which one is “thin.” Parents and children might take turns making “thick” and “thin” shadows. Have everyone cut out their own two paper people—one thick and one thin. Make sure that parents help children who may not know how to handle scissors. Make sure the children do not cut themselves. Having fun together reduces stress. If the children’s fine motor skills are developed enough, they can create and cut out their own paper people. Using scissors is preparation for writing. Vocabulary: thick and thin; fat and slim. Working together is part of social development. Social development: discussion of teasing and bullying. 2. Fat Food. Lay out five different kinds of food (or pictures of those foods) that are familiar to the group. Discuss how just eating one type of food is not healthy. If you eat too much of this or that, you will get too fat/thick (pasta, sweets, fat things). If hunger is an issue in the community, be sure to have people eat the foods you lay out. Talk about what makes a balanced diet. Use a nutrition guide such as ‘de schijf van 5’, MyPlate, the food pyramid, etc. Talking about concepts such as portions is preparation for math. Vocabulary: foods and food groups. Learning about how to stay healthy. 3. Put a bunch of sticks of varying thickn ess in a box. Let everyone pick a thick one and a thin one. Some people might need to trade sticks before everyone has a thick one and a thin one. Trace the sticks on a piece of paper. Turn this into a drawing. 4. The seed of a legume first gets fatter when you add water, then it starts to sprout. 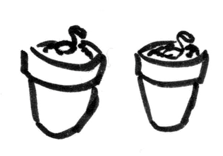 Everyone gets a clear plastic cup (or jar), cotton wool, and a couple of vegetable seeds. Ask the children to wet the cotton as soil for the seed and put it in the cup (or jar). Then they can put their seeds on top of the “soil”. Help the children write their names on their own “pot”. Talk about growing vegetables. What do plants need? Light, warmth, water. If the plants are going to grow in the common area, have the children place their “pots” in a place where they will get enough light. Talk about how the plants will get enough water. Or let everyone take their “pot” home. Discuss what to do with the plants once the seeds have sprouted. Vocabulary. Can include names of plans and parts of plants: roots, stems, leaves, buds, flowers. Order of events prepares for math. Talking about what you can do to improve your own life. Explain why it is important to eat vegetables. 5. Let everyone feel an empty wallet: it is thin. What can you do to make the wallet thick? Group discussion: How do you make money? By earning it. Doing what? That differs according to the situation. Introduce the idea of savings. Possible social development: stealing, begging, earning, getting. 6. Make a wood fire. You start with kindling, thin twigs that catch fire easily. The thicker branches catch fire later, but they can keep burning for a long time. This activity must be done in a safe place! Personal safety: Be careful around fire, it’s hot. You could burn yourself on it. Health: What should you do if someone does burn themselves? 7. Give everyone a piece of paper with a picture of a wallet. Have them draw the coins that need to go in it to make it thick. You could also have them draw the coins on colored paper and cut them out. Also have everyone draw what they think is worth saving up for. Everyone gets to decide for themselves what they find important. Saving up money prepares for math–and for life! 8. Have everyone draw three animals: one skinny, one a bit chubbier, and one fatter than the other two. Using your imagination: what do you like to draw? Fat, middle, and thin prepares for math. 9. Have the people wrap string around a stick to make it thicker, then fold cloth around it to make a doll. Wrapping string around a stick develops fine motor skills and so prepares for writing. Making a doll means using your imagination. Talking about how to make your own toys from what’s available develops thinking about what you can do. Understanding of what is normal in your own culture. Closing: Who can make a fat belly with their hands? If you wish, hold the drawn head on a stick (activity #10) to finish the figure. Leave the club with the fat figure. 1. Act out. One person acts like they are lifting something very, very heavy. Another person acts like they are picking up something very, very light. They pantomime this (do not use any words). 2. Group Discussion. What are some things that are very light? What are some things that are very heavy? Talk about things which are found in the community. Name them in the local language and increase the children’s vocabulary. 3. 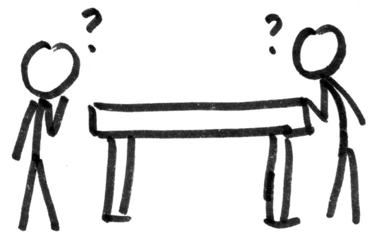 Work together: how many people are needed to pick up this heavy table (or some other heavy thing in the classroom—if necessary, use a grown-up person!)? First have the group estimate or guess. Then try it with that same number of volunteers. 4. Scale. Everyone weighs themselves and gets a paper with their name and weight written on it. The leader might also ask who is lighter and who is heavier, grown-ups or children? 5. Lay a little piece of paper and a heavy block of wood (or stone) on the table. Everyone takes a turn choosing one or the other to pick up. If they choose the light thing, they have to name something which is also light. If they choose to pick up the heavy thing, then they need to pay attention to the muscles they use. Tell a bit about muscles. 6. Suppose you need to move something that is too heavy for one person. How might you do that? (For example, a big truck that won’t start—push it with a couple of people? Pull it with a horse?) Everyone draws possible solutions. 7. Birds are covered in feathers. Are the feathers heavy or light? Why? Show the group a feather. Give everyone a piece of paper with the shaft of a feather already drawn on it. Have everyone finish drawing and coloring the feather. 8. Do a craft to make birds. Perhaps use templates to trace birds or to decorate something (a pot? A box? A card?) with birds. 9. Have everyone in the group draw heavy and light things on little pieces of paper. Mix up the papers. Everyone exchanges papers with the person sitting next to them and sorts their neighbor’s drawings into light and heavy things. Closing: Everyone walks outside pretending to hold something very, very heavy. Look like this is hard to do, walk like it is hard to do, set the pretend heavy thing down outside and take deep breaths (or groan or . . .). 1. Sing a short song. Sing a longer song. Discuss the difference; the short song has less words. If you walk here from home and you sing the same song all the way, which song would you sing more often? Have one person sing the short song and another sing the long song. Who is done faster? 2. Have everyone stand in a row and stretch out their arms. Who has the longest arms? Now have everyone change places so they’re lined up according to the length of their arms, with the person with the longest arms on one side and the person with the shortest arms on the other. If the group can sort themselves, let them, but if this is too complicated for the group take charge or appoint a suitable leader. 3. Have each child stand in front of their parent. Who is tallest? Is your mother (or father)? Where do you come up to—your mother’s knee? Her elbow? Her waist? Let everyone pick another person to compare themselves with. a – Which string is shortest? – Which string is longest? b – Find two short strings which when put together are the same length as one of the long strings. c – Lay all the pieces of string end to end. d – Put the strings in order from short to long. e – Lay strings end to end so they form multiple ‘lines’ of equal length. 5. Have the children use all of their strings to make a picture of a house. Glue the picture to a piece of paper. 6. Give everyone a piece of straw and a pair of scissors. Have them cut their own straw into longer and shorter pieces. Next have everyone team up with the person sitting next to them. Have them mix their straw pieces together, then sort the straws in order of length. 7. Have everyone trace on of their hands on a piece of paper. The leader adds the names of the fingers. Be sure to use the right script. This can be done in the mother language, the national language or both. Have everyone measure their fingers with a piece of string. Which finger is shortest and which is longest? Closing: To leave, line up from shortest to tallest. OR Stand in two lines. One line sings the short song; the other sings the long song. Walk out singing. 1. Count out loud. Count all people present in the national language as well as the mother tongue. Next count the children. Ask everyone to remember this number. Then count the parents. Ask everyone to remember this number. Add the two numbers. Children discover that the sum of the two numbers is the same as the number of all those who are present. Write the sum on the board. That’s all that is needed at this point. Further explanation is above the level of such young children. 2. Show the number TWO. Ask everyone to find something that they have TWO of (socks, shoes). Have them wave with their TWO hands, stamp with their TWO feet, feel their TWO ears so that they all feel number TWO. Have a parent name TWO hands, feet, etc. using the mother tongue. 3. Everyone sits in a circle. Put a doll (or child) in the centre of the circle. The children place TWO little dolls behind it. Game can be expanded by having them take turns putting TWO of the same thing in the middle of the circle (two books, two sticks, two parents . . .). 4. Make TWO. Hand everyone a coloring sheet with a simple drawing on it. For example, a lake with a duck on the water, a fish in the water, a deer that comes to drink, and a cloud in the air. 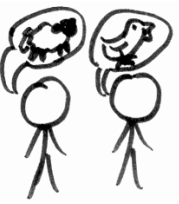 Have everyone draw a second one of each animal so that there are TWO of each. OR give everyone a piece of paper and ask them to draw a simple scene on it like the forest, the garden, the street, a house. Have them exchange papers with the person next to them. That person draws a second one of each item on the paper. 5. Music for TWO. People stand two on two, hold each other’s hands, and move their hands together to the music. (Long description: Everyone pairs up in groups of TWO. The pairs stand opposite each other holding each other’s hands. Play music or sing a song. Everyone swings their clasped hands around and around in time to the music.) Look for music with a two-four-or-eight beat. Try to choose music in the mother tongue or music that suits the culture. 6. Rhyming TWO. Make a set of cards. Everyone gets a card with the drawing of a different object. Someone else has a picture with an item on it that rhymes with the object on your card. Try to find who belongs to you by matching the rhyming cards. In the end you have pairs of TWO. 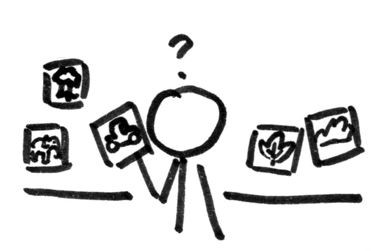 The pictures may have been drawn at a previous session. 7. Give everyone a small card with a different word written on each side. Make sure one of the words has TWO of THE SAME letters. Only that side can be decorated. Closing: line up in twos, perhaps boy-girl, boy-girl or trousers, skirt or sweater, shirt, etc. Leave two by two. 1. Sing a song together. Make different words using THE SAME melody. Put cards with pictures on the table which inspire the participants to think of a text or idea to develop the song. OR choose a song which already has two different sets of words to THE SAME melody. 2. Copy me. A leader stands in front of the group. Whatever the leader does, everyone else must do THE SAME (yawning, pretending to comb hair, drive a car, cook, dress a baby, or any other common activity). The person who raises his hand first may guess what the leader is pretending to do. Take turns being the leader. 3. Follow me. Pair up. Have all the pairs go from one side of the classroom to the other. One person in each pair is the leader. He walks, jumps, hops, swings his arms wildly, etc. The follower does exactly THE SAME. At the other side of the room switch. The follower now becomes the leader. 4. Follow the leader. Or have everyone stand in a line. Everyone must follow the leader and do exactly what the leader does. Take turns being the leader. 5. Draw the same. Give everyone a sheet of paper. Have them draw a picture exactly the same as the example shown them. 6. Different and same. Choose three participants with distinctly different clothes. Discuss the differences together, name the different pieces of clothes, and name the colors. Then have everyone may make a drawing of someone else in the group. 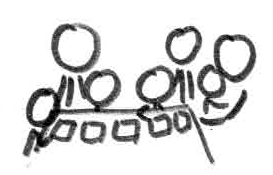 When the drawings are finished, the group looks at each drawing and tries to guess who has been drawn. 7. Distribute a worksheet with different letters/words on it. Write a letter/word on the board and have everybody point at the same letter/word on their worksheet. Closing: Dressed the same. Say, “Everyone with the SAME kind of socks as ____ may go out first;” “Everyone with a hair band the SAME as _____ may go out next.” “Everyone without socks . . .,” etc. 1. Have a box of small items. Hide one under a cloth. No one can see it. It is GONE. The participants guess what it is. Help them by giving small clues. 2. Take turns choosing an item from the box and hiding it under the cloth. 3. Put six small objects on a plate. When no-one looks the leader takes away one of the items. Show the plate again. What has disappeared? 4. Write everyone’s name on a separate card or piece of paper. Lay these out and have everyone find his/her own name. Then give everyone another card with their name on it with one letter missing. Instead there is a dot or ____ in its place. They can write (or ask someone else to add in) the missing letter. 5. Make a coloring sheet with part of the drawing missing. Talk about what is GONE. Finish the picture by drawing the missing part. 6. Play Hide & Seek. 7. Everyone closes the eyes. The leader touches a person who quietly goes outside (or two people, a parent and a child). When the leader says so, everyone opens their eyes again. Who has GONE? Those who are outside will, of course stay close to the door, so they can hear if their names are guessed. When it becomes too simple, everyone has to change places after someone has GONE. Repeat the game several times. Closing: If the children are old enough to be losing their baby teeth, let the children who are a missing one or more teeth because of this leave first. If the children are not old enough, do not do anything with missing teeth. 1. Write directions connected to WHERE on cards (stand behind the chair, sit under a table, put something on the windowsill, go and stand in between two people, go and sit in the hallway, go and sit on the chair, etc.). One person comes forward and chooses one card. The leader helps to quietly read to the participant. The person follows the direction. Others guess what was written on the card. 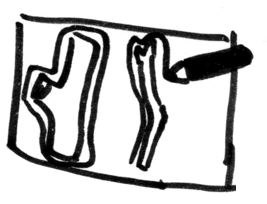 Option 1: Use simple line drawings to draw “where” on the cards instead of writing the directions. Option 2: First hand out cards or pieces of paper to everyone in the club. They draw or write WHERE on a card. Then play the game as described. 2. WHERE does it go? 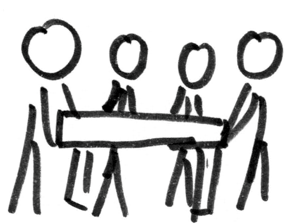 Together make a drawing on a very large sheet of paper or use a school board. One person is the lead artist. This person tells the others WHERE to draw what shape. The others take turns drawing the shape on the board. When it’s finished, it should be the drawing of a person. Directions for drawing: One person draws a big circle. The next person draws a smaller circle on top. Draw lines above the small circle (hair), a triangle in the small circle (nose), a line underneath it (mouth), two lines straight down underneath the big circle (legs), down below the big lines attach small squares (feet), a line on the left ending on the big circle, the same line from the right ending on the right side of the circle (arms), small circles are attached to these lines on the left and the right (hands). Isn’t this clever? The group gets divided; in each group someone speaking the mother tongue well will be asked to lead. They play the game in the mother tongue. Option 1: Only the leader knows what the drawing will be. Option 2: Draw something else. A car? A house? A cat? 3. WHERE does the sound come from? All eyes are closed. The leader touches one person. That person walks somewhere and says: ‘beep’. With eyes still closed, everyone else points to where the noise came from. Then everyone opens their eyes and checks whether they are pointing in the right direction. 1. Story Picture/ Colouring Sheet. Show a picture with many things someWHERE (on the cupboard, beside the door, on the roof, in the tree, etc.). Talk about it together. What do the children see in the picture? Where are these things in the picture? Have a parent repeat this in the mother tongue. Then give everyone their own copy of the picture to color. 2. Where are the birds? Everyone or every set of parent-and-child gets a sheet of paper. Give everyone 3 trees to cut out and glue on the paper. Glue only the trunks on the paper. Leave the leaves free. Then give everyone 10-20 birds to cut out. The leader tells WHERE to glue each bird. For example: in a nest; on a big branch of one of the trees, behind a leaf, in the thinner branches of the tree, in the tree at the back, etc. Variation: participants take turns telling where to place a bird. Variation: make the same activity as an entire class. Put the trees on a big poster or sheet of paper. Everyone gets a bird. Everyone takes a turn putting the bird someWHERE. The class looks to see whether the bird has been placed correctly. Closing: Everyone finds a different place someWHERE in the classroom to stand, sit, or lie down (on the table, behind a chair, under the blanket, in between the windows). Say: the one standing in between the windows can go outside, the person on the chair can go now, the person who sits in the corner may go now, etc. 1. Line Game. Draw a long line on the floor. Stand on the line, say ‘ON’. Stand in front of the line, say ‘IN FRONT OF’. Stand behind the line, say ‘BEHIND’. One person says: in front of…, behind….., on…. All quickly follow the instruction and stand in the right place. Then just the parents play. Say the words faster. The person who gets confused and makes a mistake has to sit down. Next just the children may play the game. Variation: Play the game again in the mother tongue. 2. Change at the lines. Make a line through the middle of the classroom (draw with chalk, lay down a long rope, put down tape . . .). Ask who is good at imitating an animal. Have a volunteer (A) stand on one side of the line. Everyone moves to that side of the line and imitates an animal just like “A”. Then choose another volunteer (B) to imitate a different animal. “B” stands on the other side of the line. Everyone moves to the other side of the line and copies “B.” Explain that we are going to move all around the classroom, wherever we want. But whenever we are on the “A” side of the line, we have to imitate animal “A” and whenever we are on “B” side of the line, we have to imitate animal B. For example, on one side of the line, we are all frogs. On the other side of the line we suddenly are birds. Write the names of the animals on the board with a small sketch of them. Variation: have the group move around the classroom in a big circle or following a leader who moves all around the room. Whenever they cross the line, they change what animal they imitate. Variation: if it is not acceptable to imitate animals, be something else—cars and airplanes; swimmers and dancers; babies (crawling) and old people (walking with a cane). 3. Draw 3 short lines fairly far apart on the floor. Line up and follow the leader over the three lines. Every time the leader crosses a line, the leader has to change the way they move. For example, first march with knees high up, then hop, then on tip-toe, etc. 4. Play tag. You may only run up to the line. When you are ‘tagged’ you stand outside the line. 6. Coloring sheet. Everyone gets a coloring sheet with a line drawn through the middle. Color things on one side of the line one color and things on the other side a different color. Variation: everyone gets a sheet of paper with a line drawn down the middle. They make their own drawing, with everything on one side of the line one color and things on the other side a different color. 7. Handwork with lines. Make lines on sheets of paper, empty paper towel rolls, whatever is handy and inexpensive. Everyone glues thread, string, or yarn along each line. Closing: The door opening is a line. We walk outside. Up to that line we must be very quiet. Once we go over that line (outside the classroom), we can make as much noise as we want.